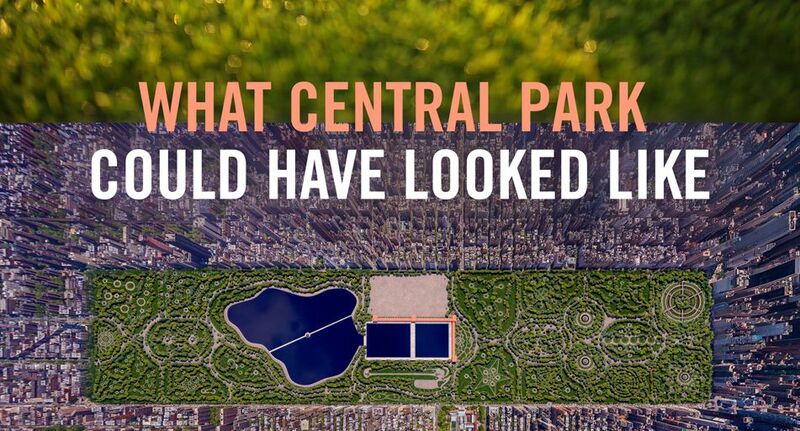 New York’s Central Park seems like it was always there – and could exist in no other form. But it could have been so different. The famous design by F. L. Olmsted and C. Vaux was actually chosen by competition in 1858 – and there were 32 other entries that never saw the light of day. Only one of those runners-up survives today. The rules of the contest were specific: the design for Central Park needed to include a parade ground, a fountain, a watchtower, a skating arena, four cross streets, and room for an exhibition hall. Olmsted and Vaux combined these elements into a winning plan that doubles as a microcosm for the State of New York itself. In the 21st-century, it’s a welcome breath of fresh air at the heart of the sprawling metropolis. For visitors, it’s a must see: Time Out New York lists no less than fifteen things you must do in Central Park when you visit the city. But we couldn’t help but wonder: what might that surviving competition entry have looked like today if it had won that contest 160 years ago? The sole surviving design from the 1858 competition was drawn up by a park engineer named John J. Rink. This bird’s eye-view of Rink’s plan reveals the form of the park. It was to be divided into symmetrical shapes called grounds that rose and dipped according to the topography of the land. He makes today’s park look positively chaotic! Rink’s watercolour drawing was labelled a “folk-art fantasy of Versailles,” in reference to the famous French palace. And there is something of the European fairytale about the way that today’s open spaces disappear beneath Rink’s spiralling tree-lined alleys and topiaries. Put in the context of the city, it’s clear that New York cried out for a large green space like this. Central Park is an opportunity for locals and visitors to get away from the bustle and enjoy nature and culture. Today, the Metropolitan Museum of Art sits in the park just off Fifth Avenue; Rink’s design offered instead a two-wing museum at the south and east edges of his reservoir. It would have been almost as big as the Met. The Spirit Ground in the foreground appears to have a statue in John Rink’s rendering. In today’s Central Park, the closest statue to this would be the bust of the Irish poet, Thomas Moore. But Rink’s imagination was more patriotic: he named the roads, gates, and other elements after US presidents and patriots. Rink was influenced by French garden design, in which water and reflections add symmetry and tranquillity to a space. In this image we see Rink’s Cronton Lake and water reservoir. Beyond the reservoir is the parade ground that the competition called for: in Rink’s design, this is Central Park’s only open land. It is curious to note how modern the real Central Park looks, compared to Rink’s design – which is very much of its time. The park as it stands has evolved to become a far more natural-feeling place compared to the European-style grandeur of Rink’s plans. Some say that the park was originally suggested not to improve the lives of regular people, but because the land was otherwise unusable. Making it pretty would boost the value of surrounding land for New York’s powerful property owners. But today’s park is a wild and welcoming place where ordinary people can exercise, rest, and play. A big thank you note to The Bowery Boys for their help with this project.